It was just one of those days, when the weather is gorgeous, and you have all the time on your hands, and you crave sugar! Just had to make something quick, so I pulled out my "Baking from my home to yours" book by Dorie Greenspan, and landed my eyes on thumbprint cookies. Actually never made them before, and it sounded like they would taste like vanilla crescents, which I LOVE! They do, with a bonus of fruity marmalade/jam. 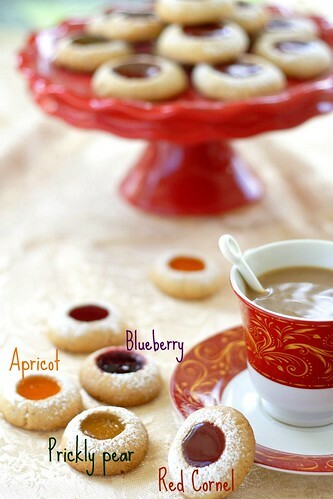 I have more than enjoyed these cookies, and I have really gone crazy with varieties of jams/marmalades. Worked well with all of the flavors, though for my taste Red cornel aka European cornel, was just perfect. Is there someone out there who never had these cookies? If yes, you better hurry up, it’s way to simple, and way too melt-in-your-mouth delicious to pass up! Position the racks to divide the oven into thirds and preheat the oven to 350 degrees F. Line two baking sheets with parchment or silicone mats. Whisk together ground nuts and flour. Working with a stand mixer, preferably fitted with the paddle attachment, or with a hand mixer in a large bowl, beat the butter and sugar together on medium speed until light and fluffy, 3 to 4 minutes. Add the extracts and beat to blend. Reduce the mixer speed to low and gradually add the nut-flower mixture, mixing only until it is incorporated into the dough. Working with a teaspoonful of dough at a time, roll the dough between your palms to form small balls and place the balls 2 inches apart on the baking sheets. Steadying each cookie with the thumb and forefinger of one hand, use the pinkie of your other hand (or the end of a wooden spoon) to poke a hole in the center of each cookie. Be careful not to go all the way down to the baking sheet. Bake for 15 to 18 minutes, rotating the sheets from top to bottom and front to back at the midway point. The cookies should be only slightly colored–they may even look underdone, which is fine: they should not be overbaked. When the cookies are baked, remove the baking sheets from the oven and let the cookies rest on the sheets for 2 minutes before transferring them to cooling racks with a wide metal spatula and sifting confectioner’s sugar over them. Repeat with the remaining dough, remembering to cool the baking sheets before baking the next batch. Bring jam to a boil in a small saucepan over low heat, or bring to a boil in a microwave oven; remove from the heat. Fill the indentations of all the cookies with enough of the hot jam to come level with the tops. Cool to room temperature. I have to try your recipe this weekend! Good job! Wow!! These look super great and simple!! YUM! I have had thumbprint cookies before but none that looked that good! They are so wonderfully pretty and yummy looking! Thank you all, glad you like them, I love sharing simple, yet great recipes with you! Draga B i ostale dame - hvala puno! yum,I love thumb print biscuits and yours are especially cute! Beautiful pictures. These look beautiful!!! (and they sound delicious!) Thanks for sharing! Ohhh, hazelnut in thumbprint cookies. Yum! Great job! They look delicious and remind me of klachkis. 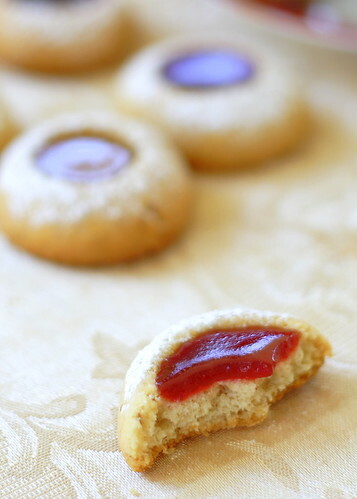 My favorite thumbprint cookies are definitely Thumbprint Cookies with Rose Jelly. I want to try yours soon though, so thanks for sharing! Stunning photos, and cookies too! Look so delicious! Beautiful pictures! I love your compositions. Those are really beautifully made! The most lovely thumbprint cookies ever! Njam njam!! OMG I looove the look of these so delicate but yummy! This is so timely! It's my tweens birthday party n the weekend and this is going to be a nice treat for them. These are so pretty! They look perfect! I made apricot thumbprint cookies a week ago but they do not look as beautiful as yours - I'll be bookmarking the recipe! I just found your blog and I am glad I did. The cookies look fabulous. Look forward to following you here. WOW ! Just found your blog! It is really amazing! Soo many things i want to bake . Thank you soo much for sharing all these unusual recipes . Wow! Bas super izgleda!!!! Divne fotke! Beautiful photos. The recipe looks easy and delicious too. I am definitely going to try these...I've got some blackberry jam (homemade) that needs to be eaten! Hi! Your cookies are beautiful. How many did you get from one batch? Well done. I saw thumbprint cookies in a restaurant. It looks so good but when I taste it, it doesn't. Yours really looks good. I will try that recipe on my daughters coming birthday. They look great! This is about my favorite cookie and you did them perfectly! I'm new here and I will be returning to your great blog for sure! 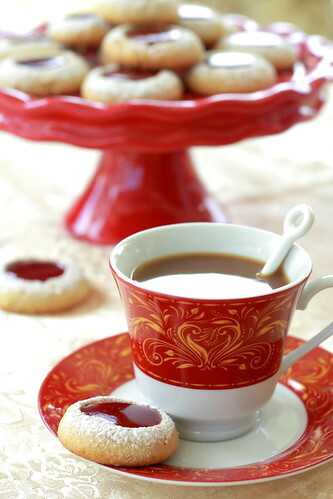 The cookie recipe is very straightforward.These little cookies look delicious.Beautiful pictures,Melita! Great blog, and marvellous photos! My fisrt visit to your blog and it is awsome! I'm becoming one of your followers. I loved this blog. Very cute, very delicious everything..
Hi! I've just stumbled across your blog, been through your recipes (oh my gosh that Egyptian torte) and I love all of your recipes and your beautiful presentation. I'd just like to say well done, and I'll be following. Your thumbprint cookies are so beautiful (and your photographs are amazing)...so many delicious flavors! Wowwwwwwwwwwww!! que bueno!!! me encantan estas galletas y me encanta tu blog!! pleaaase! ive been around since march this year and i still have zilch followers! Oh my gosh these cookies look fabulous! They're just gorgeous! A happy new year. Happy Birthday!